The Oberoi Rajvilas Jaipur offers unique 5-star accommodation in Jaipur City. Set amidst beautiful greenery, this luxurious property boasts a pool, 3 dining options and free on-site parking. Decorated with modern interiors and neutral colour tones, the stylish rooms offer large windows that overlook the greenery. Each well-appointed room is equipped with a sofa seating area, flat-screen TV and bathroom with a bathtub. Guests can exercise at the gym or indulge in body treatments at the spa and salon. Ticketing and car rental arrangements can be made at the tour desk. Available for all-day dining, Surya Mahal & Courtyard serves international dishes and fine wines. Rajmahal restaurant offers Indian specialities for dinner, while wines and spirits are available at Rajwada Library Bar. 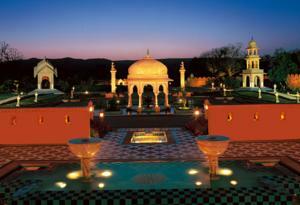 Jaipur Oberoi Rajvilas is 8 km from the City Centre and 10 km from Hawa Mahal. It is 14 km from Jantar Mantar, Jaipur Railway Station and a 25-minute drive from Jaipur Airport. Rooms: Hotel Rooms: 71, Hotel Chain: Oberoi Hotels & Resorts. Wi-Fi is available in the entire hotel and charges apply. Free! Up to two children under 8 years stay free of charge when using existing beds. There is extra beds/baby beds in a room is 0 capacity for extra beds/cots in the room.